hand. New Orleans is no exception. Orleans, over a hundred years after his death. several years. In later years, he was operating a small store on Orleans Street which became very successful. genial in manner. He spoke several languages fluently, which undoubtedly helped in his success. money to innumerable New Orleans charitable organizations and his door was always open to people in need. in St. Louis Cemetery No. 3 on Esplanade Avenue. Above, this was the Lafon Boys' Home from 1893 - 1906; it was located on St.
6800 block of Chef Menteur Highway; photo, ca. 1935. 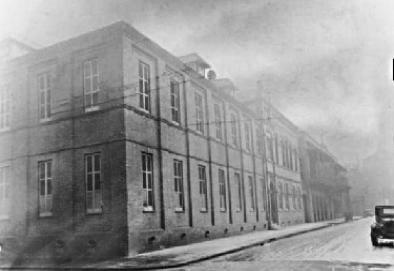 Thomy Lafon Public School, 2900 block of South Robertson; photo, 1932.